The disc and contents on it can be GREAT, but without the right packaging for your CD or DVD, it may never get noticed. At Media Tech Plus we provide CD/DVD Packaging for direct mail and presentations, products launch kits, multi media kits, software and literature packaging, POP and displays. We have one of the largest selection of standard and custom CD /DVD packaging in North America. We specialize in custom card sleeves, custom disc mailers and envelopes and specialty sleeves. If you need standard CD or DVD cases, we print all inserts and wrappers in-house from our Digital Press right here in Orlando. Nobody beats our turn time and quality! Discs in as little as 48 hours! Duplication is a great choice when you need CD’s or DVD’s delivered fast. For quantities of 100 to 10,000 discs, we can duplicate CD or DVD products quickly and professionally in as little as 48 hours with MTP’s Express Service. Same day service is available in a pinch. 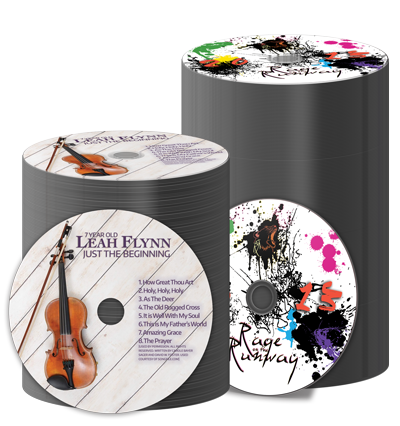 All of our disc duplication packages include free PerfecDisc printing. This high quality print process features crisp text and vibrant colors for the best on-disc printing available anywhere. Best of all, PerfecDisc printing is included at no extra charge! Get a high volume of Discs produced at a low cost! When it comes to making dreams come true, so many musicians each year turn to MEDIA TECH PLUS for duplication or replication of their new Music CD. Some of our customers order huge quantities, others only a handful for promotional use. No matter what you need, MEDIA TECH PLUS can bring you one step closer to having a Music CD Package that makes you look like a star.